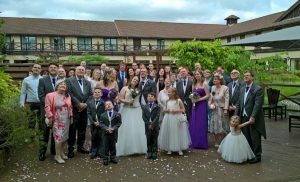 It’s fair to say that Saturday 10th June was quite a busy day as I was booked to perform at two weddings; the first in Basingstoke in Hampshire, the second near Calne in Wiltshire. Fortunately I decided that as it was a warm day I’d leave early so I could arrive at the venue, sort my tricks out and have a read of a magazine in the cool foyer whilst the ceremony took place. Unfortunately this Saturday someone decided it would be a good idea to close the M3 and divert traffic off at Reading, down the A34 and back on at Basingstoke – essentially creating miles of traffic jam right outside of the venue. This are into my “magazine time”, but luckily not as much as it could have – I arrived at the Hampshire Court Hotel a little flustered, but ready to start before the agreed start time! One of the things I like about the Hampshire Court Hotel is the way it keeps the wedding guests in one of a few different areas; giving the guests flexibility, but ensuring that they don’t go wandering off and miss the magic. Once coming out of the ceremony the guests are immediately ushered into the central garden area for the photographs, starting with the main group photograph. The bride, groom and close family then go into a separate part of this garden area for more photographs, whilst the bulk of the guests can remain in the outside seating area. Guests wanting to go inside can go into the bar area. All the this time the main room is turned around, from the ceremony room to being dressed and prepared for the wedding breakfast. Of course, once the reception is done the guests can again relax in the bar and outside whilst the room is once again turned around, this time in preparation for the evening entertainment. Of course, for Helen and James’s wedding I was entertaining for the afternoon reception, and moved between the main areas to ensure guests were entertained with some great close-up magic and mind-reading. Once the guests were called in for the wedding breakfast I hung around a little more just to make sure that the top-table didn’t miss out and had their own show between the courses! Leaving Helen, James and all their guests to enjoy their meal (and the rest of the day) it was time for to get into the car and start the trip to Wiltshire. I actually considered popping home for a quick cuppa en-route, but following getting caught in the unexpected traffic earlier in the day I decided it the safer option to continue straight on to the venue of the day’s second wedding. As it turned out I need not have worried – I ended up getting to Wellington Barn (near Calne in Wiltshire) with ease – and ended up spending over an hour sat in my car. Lucky I brought a magazine!! Unlike the Hampshire Court that I’d been to many, many times, this was the first time I had been to Wellington Barn. I must admit that it was a little un-nerving when the sat-nav announces you’ve arrived at your destination, and looking around you it’s clear to see you’re surrounded by farmers fields. Fortunately a few signs were dotted along the narrow lane and eventually my car eventually popped out into a car-park! I had assumed that Sarah and Phil had found me online, but on speaking to them I discovered they had actually hunted me down after seeing me at a wedding at Donnington Valley in Newbury a few years ago. There were also a couple guests there who were also at that wedding, including the bride and groom. It was actually nice to show them a couple of tricks because they missed it all at their own wedding as they were busy doing their own photographs. Also, quite bizarrely, there was also a guest there who saw me at a different wedding in Reading two weeks before. I remember this guests well as at that wedding all the tricks when well apart from one – and you can probably guess who that awkward spectator was…! It was actually quite a fun talking point, and fortunately everything worked as it should this time! It was also nice to met up with Wiltshire wedding photographer Elizabeth Donovan again. (www.elizabethdonovanphotographry.co.uk). The last time I had the pleasure of working with Elizabeth was two (or three, or four…!?) years ago at a wedding at Marlborough Town Hall. We both remember as it was an absolutely scorching day in August – and the bride and groom had requested that I wore my (heavy woolen) three-piece suit. I must had lost a few pound that day! I also remember it because all the guests were called upstairs for the meal. This was the first time I’d really managed to see the bride and groom so took the opportunity to perform a few tricks for them. It wasn’t until we heard applause from upstairs that we realised the Toastmaster has already announced their arrival. Oops! Anyway, back to Sarah and Phil’s wedding… Although a little remote Wellington Barn is surrounded by rolling countryside, and although traditional and rustic would be apt words to describe it, it has been fitted out nicely, and even has a separate dance-floor/disco area. Outside is also a large patio area. 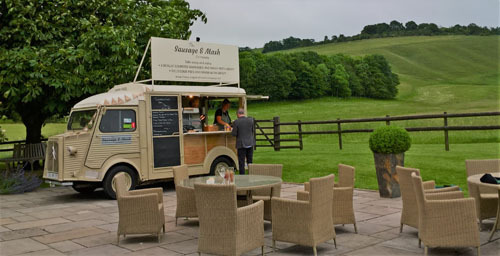 And instead of having the traditional buffet in the evening the guests could get sausage and mash from a van parked up outside. A really unique twist to a wedding. If you would like to find out more about booking me for your wedding please email robert@robertbone.co.uk or complete the contact form. Remember to include the code “WEDDING15” for a 15% discount! Everyone commented on how much you amazed them with your tricks, we will definitely be recommending you to everyone we know!